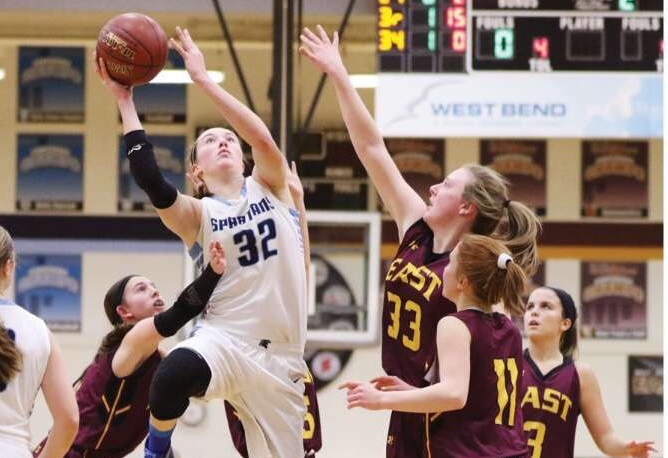 The West Bend High Schools have recently seen not one, but two students reach a major milestone in their athletic careers. East senior Auburn Larson and West junior Maddie Baker both surpassed 1,000 points in their high school basketball careers. Larson reached the number Feb. 4, and Baker hit the milestone Jan. 26. Although both were excited about the milestone, neither were really counting down to 1,000 points—they both say it’s more about the people around them and the memories that they have with basketball. Larson has similar feelings, saying that although achieving this has felt amazing, she lends credit to her teammates. “I never would’ve been able to do this without them,” Larson said. Both have had to work diligently to reach where they are today. Baker has been playing basketball since the first grade, and Larson has also spent many years perfecting her game. Auburn Larson, East senior, stands in the WBHS fieldhouse for her senior pictures. Photo courtesy of the Larson family. 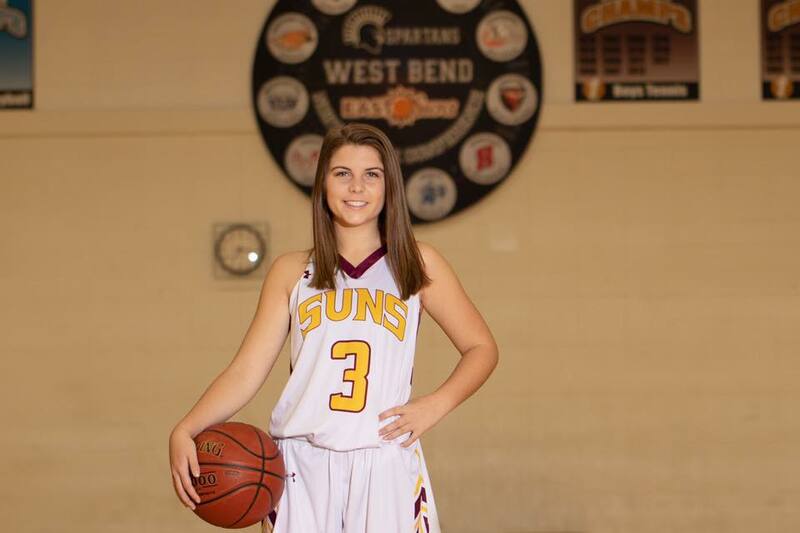 Larson does not plan on playing college basketball, but she does want to continue playing club or intramural basketball and coaching for teams. Baker was offered scholarships to play basketball in college, but she does not plan on doing so. She will continue playing for West next year. Both girls have strong support systems backing them. Larson’s mother, Tiffany Larson, is very proud of her daughter’s hard work. “As a parent, when you see your kids dedicate themselves to a sport, sacrifice leisure time, complete homework at midnight, endure some hard knocks both emotionally and physically, it is a relief to see such a positive outcome,” Tiffany said. West girls basketball coach Joe Pintens has similar things to say about Maddie.